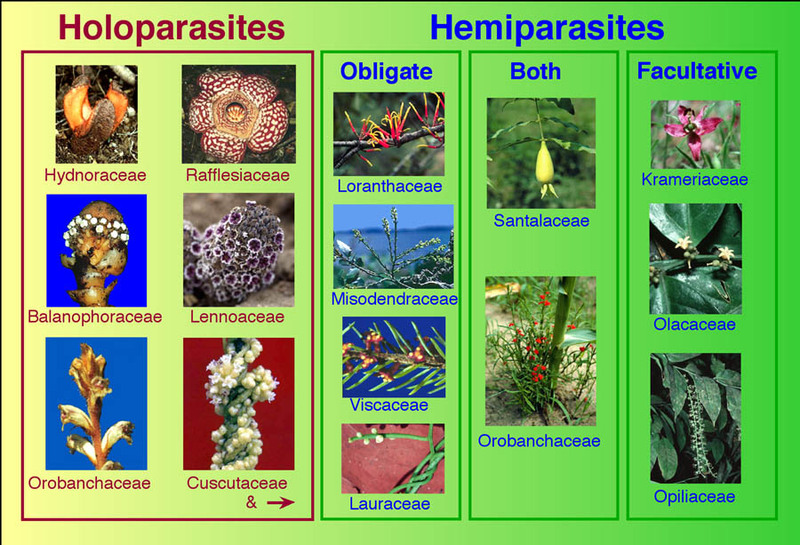 This list does not include general morphological, anatomical, taxonomic, genetic, and ecological terms commonly applied to all angiosperms but focuses upon those terms specific to parasitic plants. Also included are some terms that are often erroneously associated with parasitic plants. Example photographs illustrating the terms are provided. Autoparasite. A parasitic plant that attaches by means of haustoria to its own tissues. Commonly seen in Cuscuta (dodder), Cassytha, and seedlings of Loranthaceae (Amyema, Macrosolen). Autotrophic. Capable of feeding oneself, i.e. photosynthetic plants. Calyculus. A reduced calyx in various Santalales (e.g. Schoepfiaceae, Loranthaceae). Usually present as a toothed, shortly lobed or entire rim around the summit of the ovary. See Dendrophthoe that shows a calyculus as a lobed sheath crowing the the inferior ovary. Cataphyll. The first-formed, foliar organs (leaves) of the hypocotyl or branch meristems in some members of Santalales (e.g. Olacaceae, Loranthaceae, Viscaceae). This example of cataphylls in Phoradendron (P. reichenbachianum?) has basal cataphylls on the lateral branches as well as pairs of intercallary cataphylls located more distally on those branches. Diaphragm. The centrally located aperture that occurs at the apex of the perigone tube in Sapria and Rafflesia (but not Rhizanthes). Ectophyte. 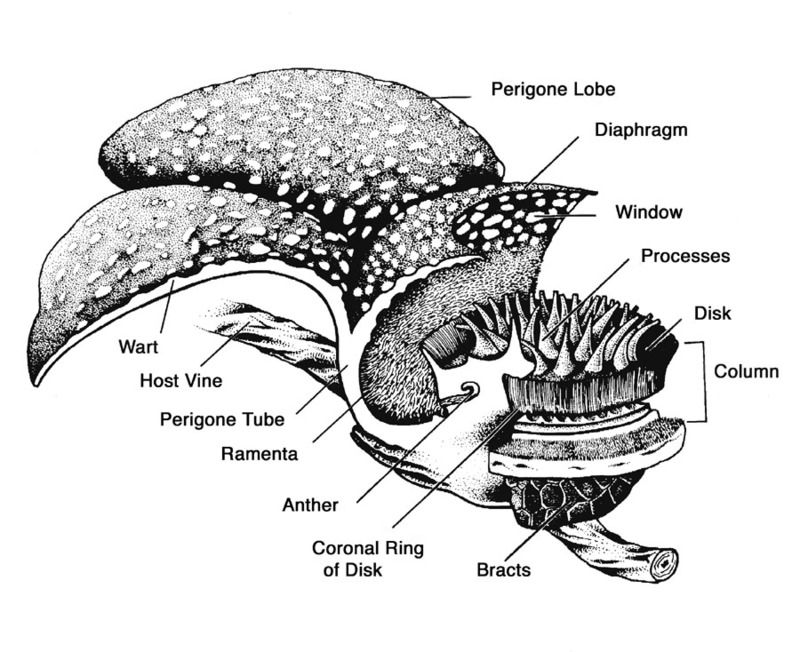 The aerial parts of a parasitic plant (e.g. stem, leaves, flowers) that occur outside the host plant; cf. the internal endophyte. Endophyte. The portion of the haustorium that occurs inside the host tissue. For viscaceous mistletoes, it may be composed of cortical strands that occur within the inner bark and sinkers that are oriented radially and traverse the xylem. See diagram of broom types in Arceuthobium and anatomical section showing sinkers in Arceuthobium pusillum. Epicortical Root. In mistletoes, adventitious roots (arising from the parasite stem) that traverse the host bark, eventually establishing secondary haustorial connections. Examples: Dendropemon, Macrosolen, Bakerella, Notanthera, Plicosepalus. Epiparasite. One parasitic plant that forms an obligate haustorial attachment to another parasitic plant. Example: Phoradendron scabberimum on P. longifolium. See also hyperparasite. Epiphytism. One plant (the "host") used for physical support by another plant. Aerial parasites such as mistletoes can also be considered epiphytes. But, not all epipytes are parasites! For example, this slide shows both orchid (Oncidium) and bromeliad (Tillandsia) epiphytes from Andros Island, Bahamas, neither of which draw nutrients directly from their hosts (they lack haustorial connections). Facultative Parasite. A hemiparasitic plant that does not require a host to complete its life cycle. Note, however, that in nature, parasitism is nearly always observed. Many members of Orobanchaceae are facultative hemiparasites such as Agalinis, Aureolaria, and Seymeria. Haustorium. The morphologically modified root which physically connects the parasite to the host. May be a primary haustorium if the radicle apex is directly transformed into a haustorium (e.g. Striga asiatica) or a secondary haustorium formed from tissues other than the radicle apex such as secondary root apices or from lateral positions on the root (e.g. Ximenia, Dasistoma). The haustoria of holoparasites are more complex (see Conopholis, Balanophora, ). This image showing many types of haustoria. Hemiparasite. A parasite that is photosynthetic (during at least one stage of its life cycle). It obtains water and nutrients from the host xylem. Some advanced hemiparasites (e.g. dwarf mistletoes) also obtain photosynthates from the host phloem. Hemiparasites can be either facultative (e.g. many Orobanchaceae) or obligate (e.g. mistletoes). Figure of Holo- and Hemiparasites. Heterotrophic. Referring to organisms that do not produce their own food (thus are nonphotosynthetic). Such organisms must then obtain organic compounds from exogenous sources. In the case of parasitic plants, this is another plant. Contrast with autotrophic. Many forms of heterotrophism exist such as saprophytism, mycoheterotropism, and parasitism. Holdfast. In some mistletoes, a disc-like swelling at the end of the radicle that forms the first attachment to the host. In this example of an autoparasitic Macrosolen seedling, the holdfast is present and a young epicortical root is emerging from it. Host. A plant that provides nutrition to an attached parasitic plant. Host-specific. 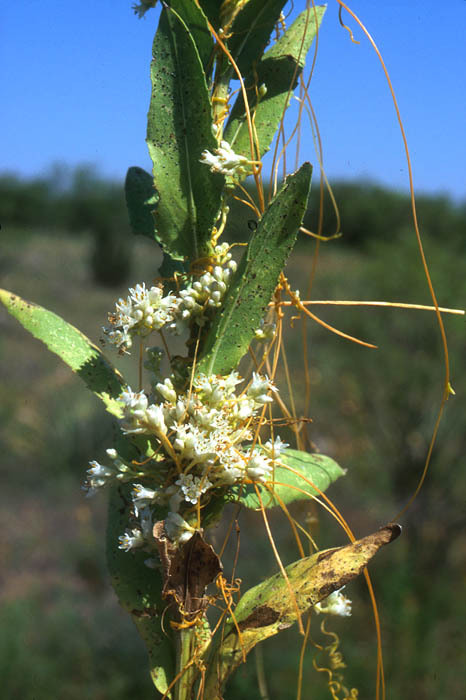 A relationship whereby a parasitic plant successfully attaches to a limited number of host species. For example, Rafflesia is only known to attach to Tetrastigma. Hyperparasite. The situation where one parasitic plant occurs facultatively on another parasitic plant of a different species. See Dendropemon emarginatus on Ximenia americana. See also epiparasite. Insectivorism. Autotrophic plants that trap arthropods with modified roots or leaves. Insectivores have evolved independently in several families, such as Droseraceae, Sarraceniaceae, Nepenthaceae, and Lentibulariaceae. The selective pressure driving the evolution is likely low nitrogen availability. Mamelon. Also called the ovarian papilla. In the female (carpellate) flowers of mistletoes such as Arceuthobium, an undifferentiated mass of tissue in which the two embryo sacs are embedded. Note, in this situation, no true ovule is formed. The mamelon is also called the placental nucellar complex. Mistletoe. A term for an aerial parasite in the order Santalales. Thus, it is both a description of plant habit as well as a taxonomic term. 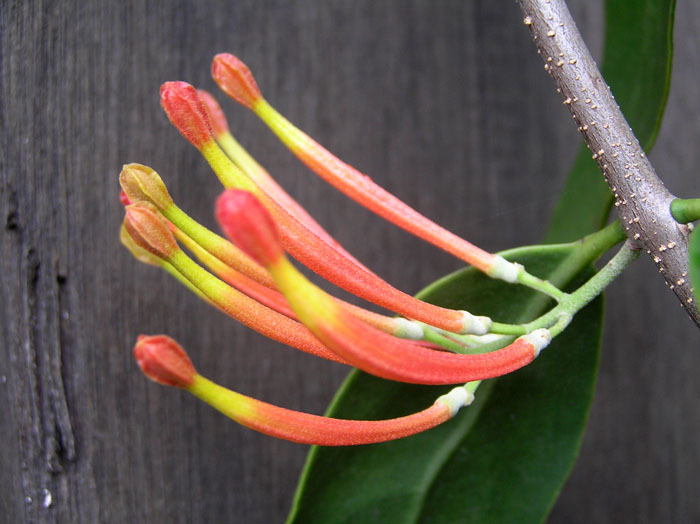 Mistletoes have evolved independently five times in Santalales: Misodendraceae, Loranthaceae, Santalaceae s. str., Amphorogynaceae, and Viscaceae. See Vidal-Russell and Nickrent (2008), pdf file HERE. Mycelium. The vegetative hypha of a fungus. In some parasitic flowering plants such as Rafflesiaceae, the endophytes are reduced to such an extent as to resemble fungal mycelia. Mycorrhizal. A symbiotic association between the roots of a (woody) vascular plant and a fungus. Two basic types include ectomycorrhizae, which occur only on the root surface and endomycorrhizae where the fungal hyphae occur inside the tree root. This photo from Baird and Riopel (1986, Can. J. Bot. 64:710-717) shows a scanning electron micrograph of a Conopholis americana (squawroot, Scrophulariaceae) seedling initiating a haustorial connection (white arrow) to a micorrhizal root of Quercus. Myco-heterotrophism. An association whereby a chlorophyllous or achlorophyllous plant obtains nutrients via a mycorrhizal fungus that is attached to a tree root. This may be a temporary or permanent (obligate) association. One may also see these plants called myco-heterotrophic epiparasites or ectomycorrhizal epiparasites. For more on these plants frequently mistaken as haustorial parasites, see the "Strange and Wonderful Mycoheterotrophs" page. Nodules. Many angiosperms, especially legumes, are able to fix atmospheric nitrogen by enlisting the help of a symbiotic bacterium. These bacteria live in special bumps on the plant roots which are called nodules. The most common type of bacterium to form nodules is the genus Rhizobium. Root nodules are sometimes confused with parasitic plant haustoria. Obligate Parasite. A plant that must attach to a host to complete its life cycle. All holoparasites are obligate whereas only some hemiparasites are obligate such as mistletoes and Striga asiatica. Parasite. A symbiotic association whereby an organism obtains at least some of its nutrition directly from another organism. 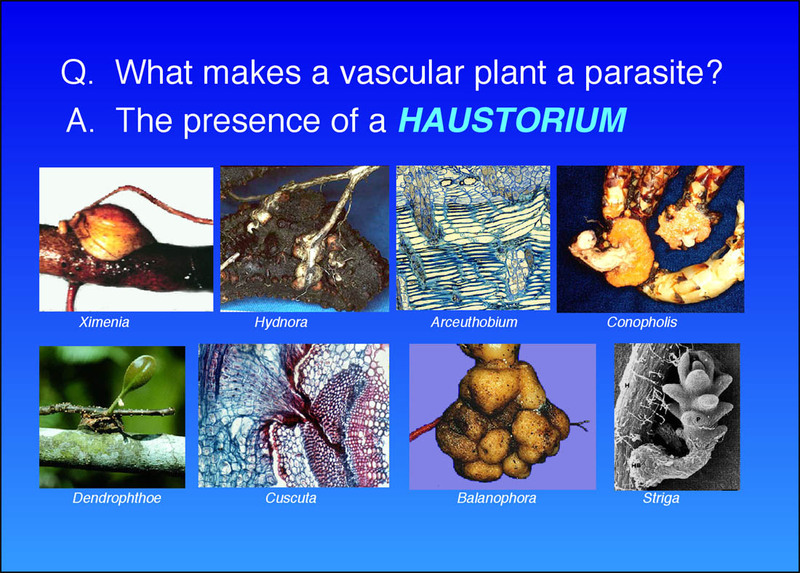 In plants, a restrictive definition includes only parasites with haustorial connections to other plants, not myco-heterotrophs. See also hemiparasite, holoparasite, facultative parasite and obligate parasite. Pathogen. 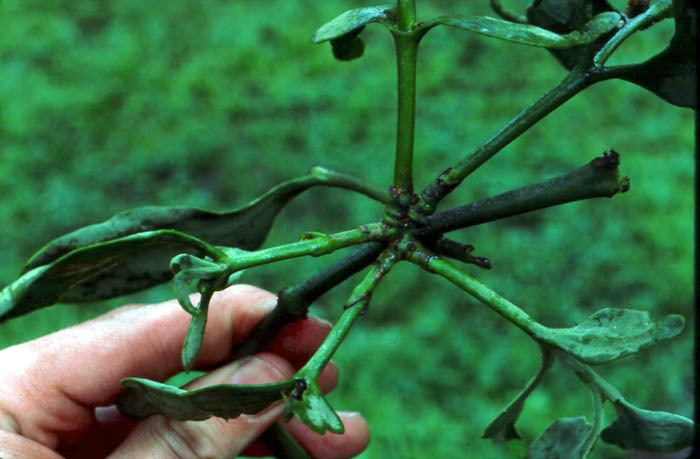 A parasite that has clear detrimental effects on the host plant. Examples of plant pathogens include Striga, Orobanche, Cuscuta, and Arceuthobium. In contrast, many haustorial parasites result in such small negative effects as to approach a commensalistic relationship. For example, beechdrops (Epifagus) is a parasite on beech trees but cannot really be called a pathogen. Perigone. In some members of Rafflesiaceae (Rafflesia, Sapria, and Rhizanthes), the perianth is referred to as the perigone. It is composed of a perigone tube and perigone lobes. Resistance. 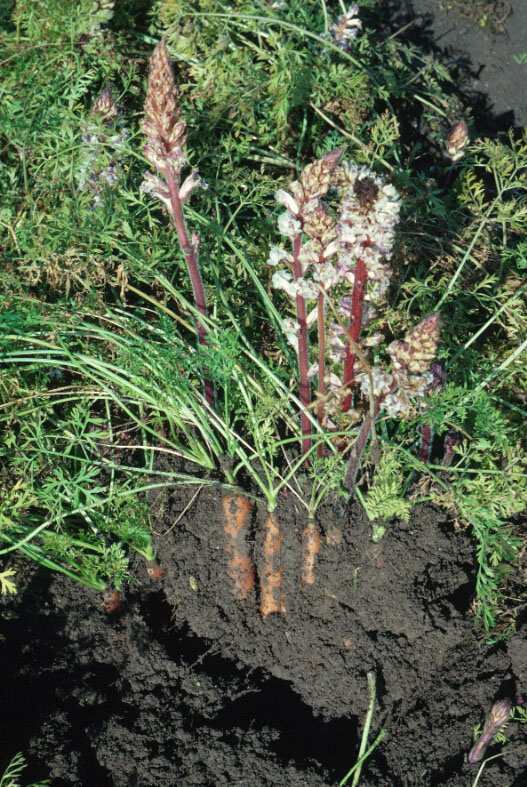 A feature or features of a plant that prevent it from serving as a host to a parasitic plant. This resistance may be manifested prior to or after initial haustorial attachment. Root Grafting. Adjacent roots of the same or different woody plants can become attached by means of cambial growth. Saprophytism. An organism that obtains its food from decaying organic matter. Technically, no flowering plants are saprophytes, only fungi. See myco-heterotrophism. Susceptible. 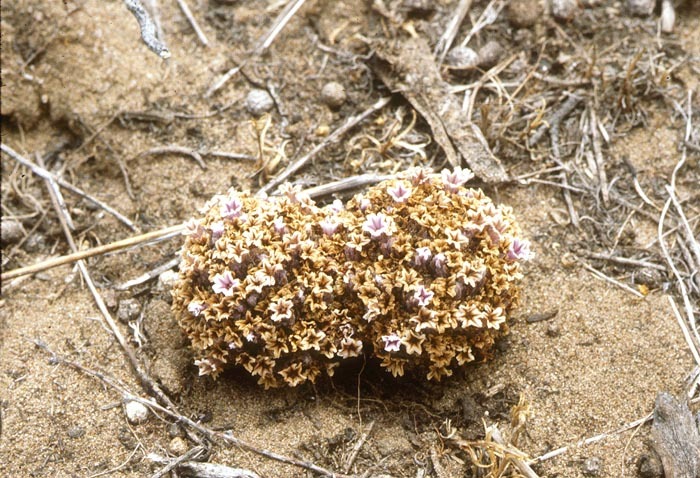 A feature or features of a plant that allow it to serve as a host to a parasitic plant. Symbiosis. A general biological term referring to at least two organisms living together. The participants are called symbionts. Includes more specific associations such as parasitism, mutualism, neutralism (parasymbiosis), commensalism, etc. Systemic infection. An infection of a host by a parasitic plant whereby the growth of the endophyte keeps pace with the growth of the host meristem. Also called isophasic growth. Can be seen in some dwarf mistletoes (Arceuthobium pusillum, A. douglasii) and Pilostyles. Viscin. A complex material covering the seeds of most mistletoes. Composed of two parts: 1) a mucilaginous pectic material that accounts for the stickiness and water-holding capacity of the viscin (oligo-D-galacturonic acid and 2) helical strands composed of cellulose. See Paquet et al. (1986, Bot. Gaz. 147:156-158). Example: Phoradendron serotinum. Witches' broom. An dense aggregation of host branches that is hormonally induced by the presence of fungal or mistletoes such as Arceuthobium. Sometimes simply called a "broom." In Arceuthobium, two basic types occur: nonsystemic brooms, such as in A. campylopodum (= A tsugense) where the parasite endophyte does not ramify within the host tissue and systemic brooms, as in A. pusillum where the endophyte meristem occurs near and divides in synchrony with the host meristem. Woodrose. A distortion of the host secondary xylem (wood) induced by a parasitic plant haustorium. The haustorium causes the host cambium to increase the amount of wood deposited resulting in a placenta-like structure. The shape of the woodrose will vary depending upon the parasite/host combination and may assume a columnar, conical or saddle shape. When the parasite tissue dies away, all that is left is the host xylem, hence woodroses are made up entirely of host tissue. In the Old and New World tropics, mistletoe woodroses are sold as curiosities and are often carved into ornate works of art. This photo shows a woodrose formed by an unidentified member of Loranthaceae and a carving of a lizard made from a similar one. Woodroses are even formed by the balanophoraceous holoparasite Dactylanthus.